Sugammadex (Org 25969, tradename Bridion) is an agent for reversal of neuromuscular blockade by the agent rocuronium in general anaesthesia. It is the first selective relaxant binding agent (SRBA). 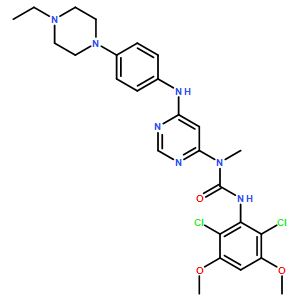 Eliglustat tartrate (Genz-112638), a specific inhibitor of glucosylceramide synthase, is under development as an oral substrate reduction therapy for Gaucher disease type 1 (GD1). Anamorelin(RC1291; ONO-7643) is a synthetic orally active ghrelin receptor agonist which is under development for the management of non-small lung cancer associated cachexia/anorexia. Eliglustat (Tartrate) inhibits glucosylceramide synthase(GCS),thus reducing the load of glucosylceramide influx into the lysosome.